← The Book is No Longer Doomed! “There are two things you do when your book first gets published. First, bookmark your Amazon page, for obsessive checking of sales rankings. Second, set up a Google Alert, in case anyone is talking about it. Or, as it turns out, stealing it. A couple of weeks after I became an author, I got an automated email: a free version of my book had popped up on a site called DailyUploads.net. 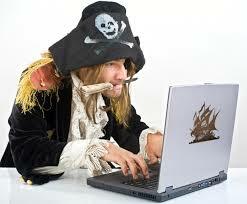 A few hours later, my inbox pinged again: I’d been pirated. “The reaction came in several stages. First, outrage: they’re pirating my book!. Next, a curious kind of pride: they’re pirating my book. Finally, pure bafflement: why are they pirating my book? At the time, the American edition – the one that had been copied – was 309,607th on Amazon. This wasn’t giving the public what they wanted: it was giving them what they didn’t even know existed. “My mistake, it turned out, was to imagine the pirates as anglers, plucking the juiciest titles. In fact, they’re trawler-men, sweeping their nets across the publishing schedules. . . .
“If you buy an eBook on line, it will come in a format that can’t be shared. But there are free software tools that strip those protections away. The resulting files are distributed across the internet – not for profit, but out of a conviction that people should be able to read what they want without paying for it, just as they should be able to watch films or listen to music. And, like everything else, it’s speeding up. In 2008/9, titles took 19 weeks to hit the electronic black market. This year, Lloyd Shepherd, a British author of historical thrillers, published his fourth novel – and found a ‘boxed set’ of all four available for download within 72 hours. “So who are these pirates? When Shepherd received the dreaded Google Alert, he went onto the forums to find out what motivated them. ‘The people who are doing this systematically have got some very odd justifications for it’, he explains. ‘Many insist that the information should be free. Others have a sense that writers are wealthy and publishers are wealthy, and therefore they’re entitled to steal from them.’ In fact, as Philip Pullman, president of the Society of Authors, has pointed out, they’re poor and getting poorer – something that Pullman links directly to piracy. “. . . according to government research, only 1% of UK internet users are reading eBooks illegally, compared to 9% for music or 6% for films. But, says Stephen Lotinga, CEO of the Publishers Association, this still amounts to 7.2 million titles per year or 10% of eBook sales. I just completed a troll through the Google search of the titles of my six published books. I found seventeen suspected pirate sites dealing in at least one of the six, with a maximum of five sites for one of my published novels. This count doesn’t include foreign sites which were selling my novels at near market prices (my publisher has a substantial foreign rights network). It also doesn’t include sites to which I sent a DMCA (Digital Material Copyright Association) infringement notice. In the past, I have had a good response from these notices: to ignore them is illegal, and usually my title will magically disappear. But many sites do not have a link to a DMCA notice, and some that do have a link over complicate the process. I’ve sent my publisher the list of the seventeen for them to work on. After all, they have may more books than my six at risk!